It’s about time I did a comic about sharing food/life in these games, eh? This is the sort of strip that writes itself, so I had fun with it. I kind of went back and forth on including Dedede’s life bar, but I went with it because I think it best clarifies that he’s getting healed. I’ve beaten Kirby’s Return to Dream Land and am currently working on the post-game content–Kirby fans will be happy for sure. 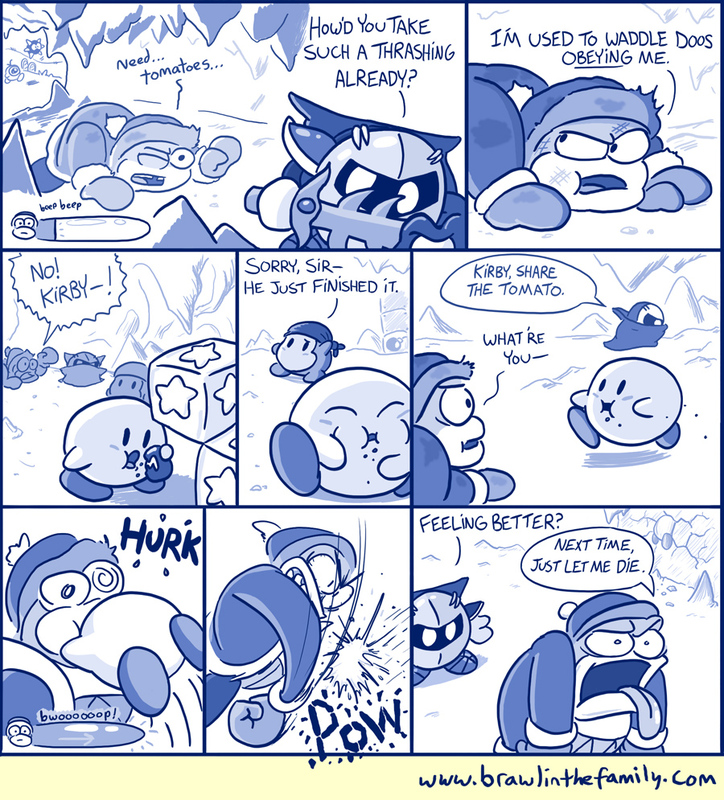 It’s a ton of fun and a very solid follow-up to Kirby Super Star (and contains the same style of multi-attack abilities that made that game so addictive and replayable). Really, my only main complaint is that it isn’t quite as ambitious as I’d like a console Kirby game to be–compared to Adventure, Super Star and Epic Yarn, which forged bold new paths for platforming at their release, RtDL plays it relatively safe. But all things considered, it’s still a great game, and just as fun with 2, 3, or 4 players! Oh, and it’s time for our HOLIDAY SALE! Yep, for the next few weeks, we’ll be running our stuff at a discounted price!